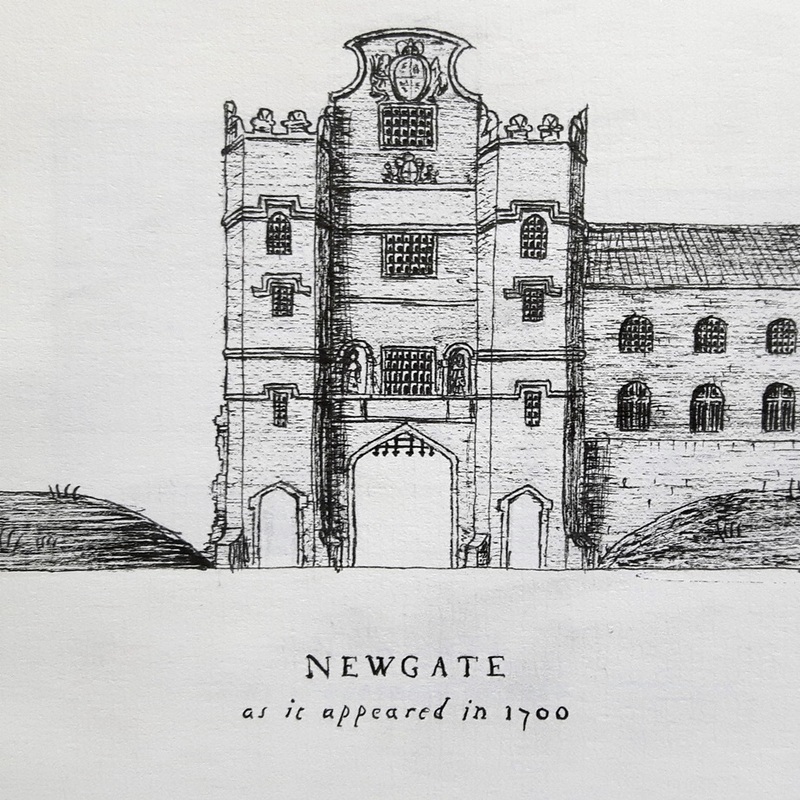 Next up in my little illustrated history of the gates of London is this – a history of Newgate, perhaps the most well known gate of the city, owing to the notorious prison that grew up around it. 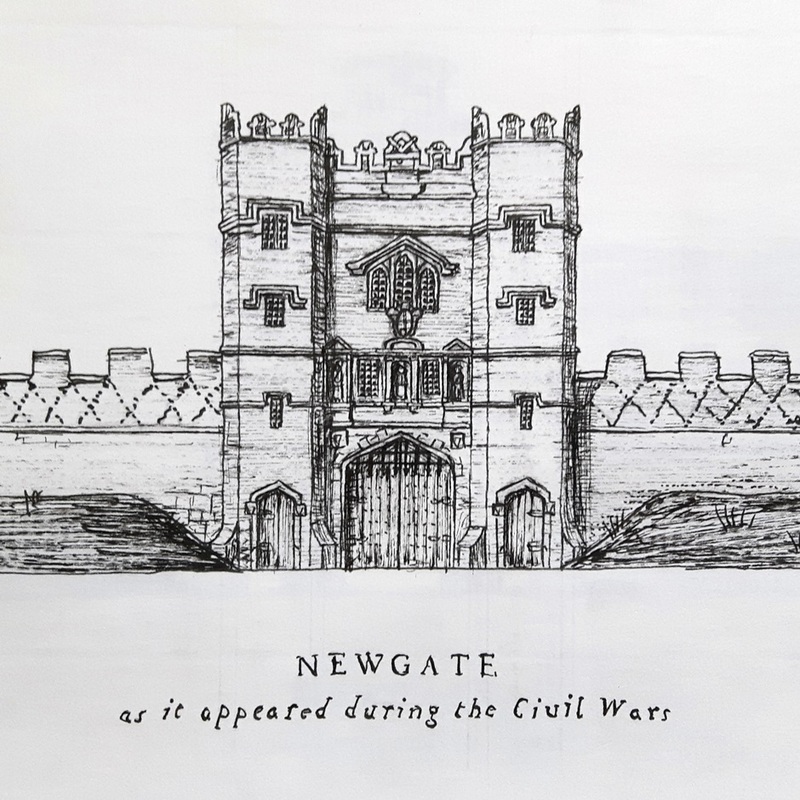 Contrary to its name, Newgate does indeed number among the most ancient gates of the city, and indeed was one of the four principle Roman gates into London. This gate stood to the west of the city and was there for on a road leading to less important destinations than those guarded by Aldgate and Bishopsgate. Infamously renowned now as a once terrible prison, the gate itself was used, like many others in London, to house prisoners as early as the 12th century. The theory I have seen behind the name is that it was likely rebuilt or extended around this time to accommodate the prisoners, which would also fit in with the increased traffic it received after Ludgate’s ease of use was likely lessened during the building work going on at St. Paul’s at that date. Of course, the name could also relate to an earlier rebuilding, since the gates were changed and even potentially in places rebuilt during the days of Saxon England. It was very possibly rebuilt in about 1080, as part of the improvement of access to St. Paul’s. It was repaired by order of the king on 1218, remaining a prison, and in 1378 the order being given to move the city’s worst criminals there since it was supposedly the most wretched prison of any in London at the time. The inmates were briefly removed in the summer of 1423 due to the generosity of that great father of London, Richard Whittington, who left a sum in his will towards the rebuilding of the gate and the prison; John Coventre, John Carpenter, John White and William Grove were given licence to rebuild the gate with these funds on May 12th 1423. The prisoners of Ludgate were again moved to Newgate between 8th April 1431 and 16th June that same year, the prisoners having complained that their new situation at Ludgate was dirty and unsanitary. There was a break out from the prison by John Offrem in 1255, a murderer, the story of whose escape reached the king and, after a blundering attempt by the sheriffs and jailors to explain why it had happed, he fined the city a vast some of some 3000 marks, which I make to be some two million pounds in modern money. The prison was the scene of another notable break-out in 1457, when three members of the Percy family –Thomas Percy, Lord Egremond; Sir Thomas Percy; and Sir Richard (or Ralph) Percy – being kept there on charges of a disorderly skirmish that had killed several people, caused a riot and escaped to petition the king for release. The remaining prisoners took over Newgate and held off the sheriffs of London and their men, until a call was sent out for the citizens of London to come to the law’s aid and help subdue the disorderly criminal mob. The three members of the Percy family who had escaped, however, seem to have been successful in their attempt to earn a pardon, although within less than a decade each would lie dead on different battlefields of the Wars of the Roses. The gate was largely rebuilt in 1555 following a fire, again between 1630 and 31, and was supposedly destroyed in the great fire of 1666 – although my research suggests it was only damaged – its reconstruction after this did not occur for six years. The statues on this gate were figures of Liberty, Justice, Mercy, and Truth, and two figures whose original names are lost to history. In the early 1700s a windmill was added to the top to aid the ventilation of the cells. All this time it continued as a prison, and this last form vanished in 1767, shortly afterwards replaced by a brand new prison complex. I’ve been collecting printed books now for over five years; aside from having learnt odd archiving techniques, having had to study numerous printers to identify works, and even become a practising bookbinder and paper restorer, I have also become very good at avoiding cataloguing my collection. I made a brief start on that very purpose about two years ago, when I came back from university, only to realise that my room was packed with about 250 disorganised volumes spanning over 500 years. I got this far. In an attempt to rouse myself again towards this quite necessary task, I’ve been working on a design for a new bookplate, something to go in each book as I catalogue them. 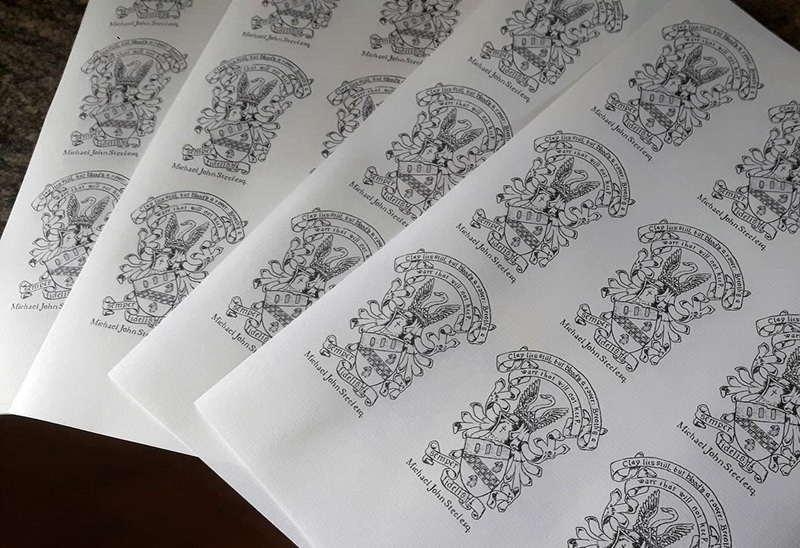 Bookplates – simply a label of ownership for a book – date back at least to the mid-15th century, and I’m sure must have their routes in monasteries and noble houses drawing their coats of arms in their books in the days of medieval Europe. 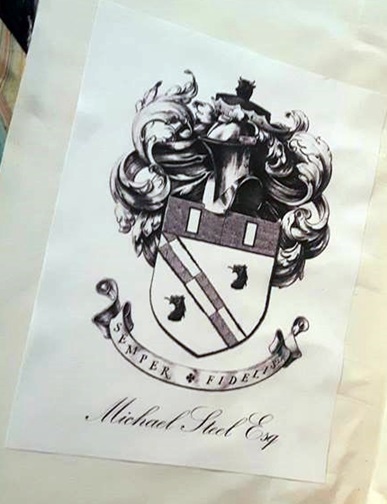 Post-medieval bookplates adhere to a few traditions, and generally consist of the owner’s name and their coat of arms, often accompanied by a motto. Some years ago I’d thrown together a couple of designs using my computer, and even got as far as printing a few of them off. They’re now sporadically spread among some of the first few books I ever restored. This time I wanted something that was a mix of a traditional bookplate, with something more of myself thrown in. I love all things medieval, but I’ve also been doing a lot of work recently that has involved William Morris and the Arts and Crafts style, so I was also looking at those artistic styles that closed the neo-gothic revivals of the 19th century. Most of all, I wanted to hand draw this one as a single piece, not have a Frankenstein of digital images. 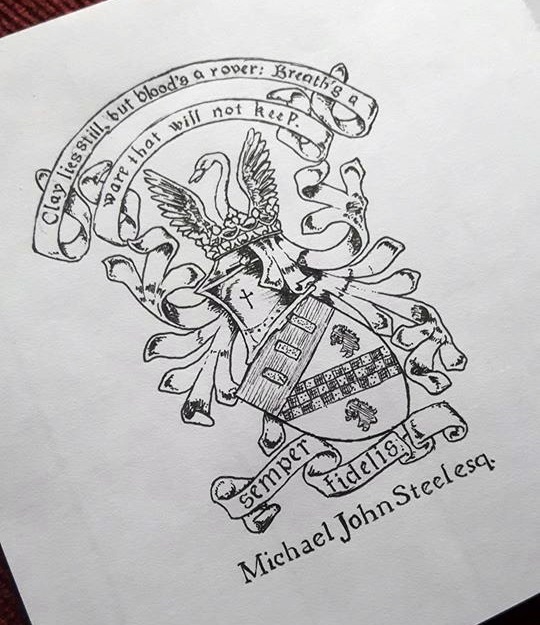 It combined a few different designs from 19th century bookplates, with fonts from the Kelmscott press, and the lines across the top from a favourite poem of mine by Housman. May I happily present this next history of the gates of London – Aldgate. This gate guarded the route to Eastern Britain, including the main route between London and the early Roman capital city of Britain; Colchester. It is supposed to be the earliest gate built in London, a questionable fact since it is likely the earliest defensive gates were built around the Roman fort to the north-west of the city, and it seems more sensible to me that the construction of any of the city gates followed after these. However, Aldgate does appear to be the oldest city gate, and was put up – prior to the city walls – in the mid-2nd century. Its key location led to it becoming the busiest of the Roman entrances into London. It appears to have been called Eastgate in Saxon times, and then Allgate or Alegate in the early days of Norman England, before finally being settled on as Aldgate as late at the close of the 15th century. The etymology of this name is obscure, and has numerous suggestions clamouring for acceptance. The first, and most common, is that it is a corruption of Oldgate, being the oldest in the city, but when it gained that name it had been rebuilt enough that it was not the oldest gate in the city, and it is unlikely its true antiquity was common knowledge. It also seems more likely that it is a corruption of the earlier name Allgate or Alegate. These two earlier names may derive not exclusively from these routes; a gate through which foreigners came, ael being Saxon for foreign; a gate through which ale was brought or near which an alehouse stood; a gate rebuilt by a man named Aethel, Aethelbert, Aethelred, or some other similar Saxon name; or possibly a gate through which all people could pass. The medieval history of the gate is a little better recorded. It was rebuilt twice, once in the early 12th century and then again a hundred years later in about 1215 following the revolts against King John, this gate the very place that in that latter year the revolting barons entered the city and took command of it. Aldgate was before this rebuilding described as the most ruinous gate in the city. I can find only two further occasions when the gate was entered by attackers upon the city, once on about the 13th June 1381 during the peasants revolt, when rebels had gained entry across London Bridge and opened Aldgate from the inside to let in their brothers in arms from Essex and beyond. The second time, on the 14th May 1471 (I have also seen this date given as the 11th May), it was less of a defensive failure, and more of a military tactic of the defending commander Robert Basset to open the gate and allow entry to a few of the attackers. These invaders were then closed in and outnumbered. This was during the Wars of the Roses, the unfortunate attackers being Lancastrians under command of Thomas Neville. It was home in 1374 to Chaucer, whose family had been in the area for many years, he lived there until 1386 while he worked as a customs official. Other notable quarters were within one of the towers just along from the gate, which, rather than being put to military use, had by the end of the 14th century become a hermitage. The entirety of Chaucer’s gate was pulled down in about 1607. It was rebuilt over the next two years in a more popular Romanesque style, with pedestrian archways that the earlier gate lacked. During the removal of the old gate a hoard of Roman coins was found, of which one Martin Bond picked two to be sculpted either side of the gate entrance. The other decorations on this new gate included statues of two knights, Fortune, Peace, and Charity; and reliefs of the royal coat of arms, and James I. All of the statues were removed at least by the early 1700s, with the reliefs both removed and the wall behind them knocked through so that windows could be put in. A second pedestrian gate was also added. This final form stood until 1761, when it was dismantled – briefly being reconstructed at Bethnal Green as a curiosity. 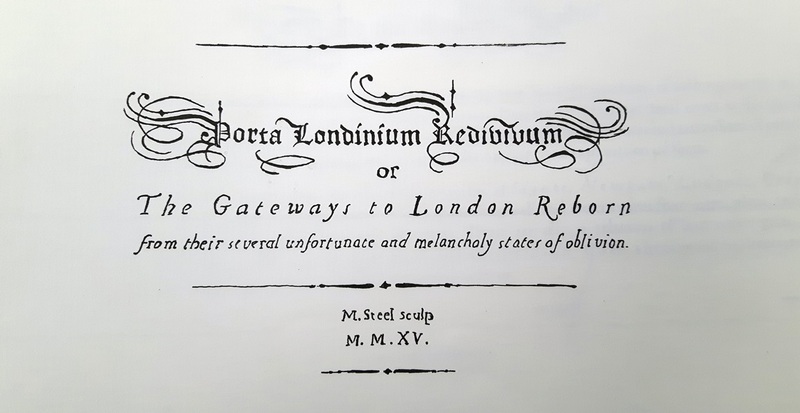 Having carefully evaded this post being adeptly edited by a cat crossing my keyboard, allow me to introduce my little work on the history of the gates of London. 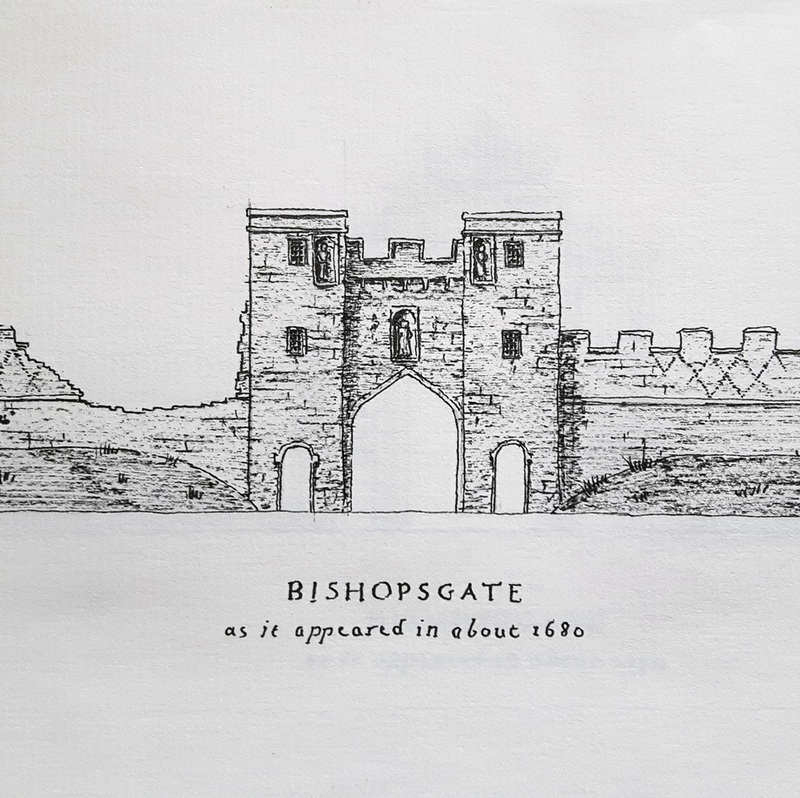 This first part introduces the subject and gives the history of our first gate – Bishopsgate. In a time in which the nature and availability of learning and the encouragement of curiosity have led to a celebration of idiosyncratic excellence among so many people upon so many subjects, with each person an expert upon their own peculiar field, I thought it right to produce a work in line with my own interest and amateur enthusiasm for the field of obscure historic knowledge. In this case, time and ability allowing, I would humbly present this minor work upon the many ancient gates of the City of London in their varied forms and antiquity. These gates that you will see presented should furthermore add to the advancement of obscure knowledge, a pursuit – even a passion – that I cannot help but admire in others, and encourage in myself. Therefore allow me to delay no longer, and simply end with an apology for errors that the reader may encounter hereafter, and hope that the interesting and rare nature of this work will make up for any lack or inaccuracy in any minor part of the content. The wall that once surrounded London was broken by seven gates, namely Ludgate, Negate, Cripplegate, Bishopsgate, Aldgate, Aldersgate, and Moorgate. These ancient and noble structures have their roots in Roman London, where what had been a small and successful settlement had grown at an explosive rate and by the mid-2nd century was the largest city in Britain. It was not long after this, in around AD200, that the city invested in a wall – longest wall built in Britain other than Hadrian’s and the Antonine wall across the north of the country. How long it took to build is unknown, but when finished it was five kilometres in length, six meters high and about two and a half meters thick, broken by towers and occasionally – thankfully not only for the convenience of the city, but also the cause of this work – its gates. Roman London had four main gates to begin with; Bishopsgate, Aldgate, Newgate, and Ludgate; the former two of these guarding the principal roadways to Colchester and York – the two other main cities of Roman Britain. One of the other seven main gates mentioned previously also appears at this time, Cripplegate, which rather than being a main city gate was one of the small gates that led into the connected Roman fort. Working with that chronology, I will begin with a description of those five most ancient gates. The north gate to the city, this was the gateway that connected the entire of Northern Britain with what would evolve to become the heart of the country. In Roman times there was less than half a kilometre between the gate and the forum, the centre of government and commerce for the city, which lay almost directly south of the gate. At this time the side of the gate without the city would have been guarded by a two metre deep dry ditch, crossed either by a static or removable bridge. During Roman times a cemetery developed beyond the gate, which the road leaving the city would have passed by, this fell into disuse by Saxon times and the history of the gate remains naturally vague throughout the famous dark ages, but was likely repaired or even rebuilt at the end of the 7th century by Earconwald, Bishop of London. It is very probably this man that the gate was named for. Following the Norman invasion it would seem that the defences of London were regularly improved and modified and the gates were adapted to medieval warfare too – Bishopsgate was rebuilt by the Bishop of London in William the Conqueror’s time. I think here another cause for the name could be suggested, since even though four centuries had passed it is the Bishop of London who paid for this construction too, so it is possible that in early medieval London this gate was the property of the bishop, or he held the right to repair it. This did not continue though, and Henry III granted the care of the gate to the guild of Hanse merchants, an originally German confederation of merchants that in their heyday were eminent across northern Europe. It was their turn to rebuild the gate in 1479. There was planned to be a new rebuilding of the gate in the early 1550s, but this was cut short after the materials had been gathered and plans made, when their monopoly on much of the English merchant world tumbled, and the king seized all their property. Unlike many of the other gates, it appears that Bishopsgate was not used as a jail, and avoided many changes that such a purpose necessitated to other gates of the city. The gate also escaped the Great Fire of 1666, with the flames being stopped before they reached it with fire breaks ‘at the upper end of Bishopsgate-street’. By this time the medieval structure was one of the most complete of any of the other London gates, the only parts that were post-medieval additions being apparently several statue niches – one in each tower and one over the gate – the removal of the battlements and possible shortening of each of the towers either side of the gate, and the addition of two pedestrian archways, running through the base of each tower. The lack of uses for this gate, however much they had preserved it so far, (the others being put to use as jails, commercial premises, or lodgings) meant that without a military need to maintain it the gate became neglected and was in the end pulled in 1731, having been used by Carvers, an officer working under the Lord Mayor, for several years previously. 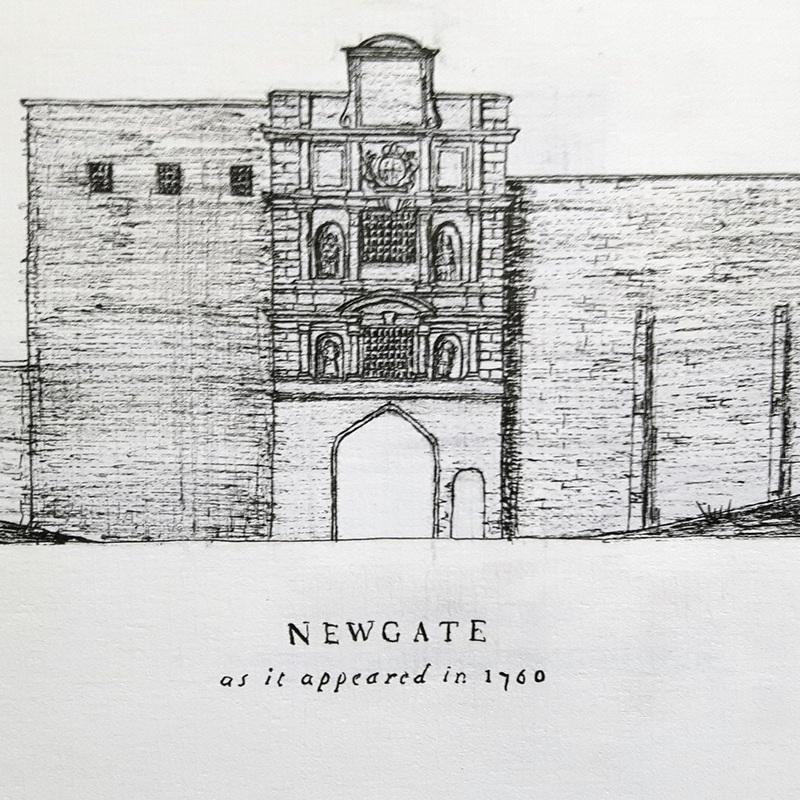 A neo-classical gate was built to replace it, which lasted less than three decades, and was demolished in 1760.